PVC 3/4" x 60' Electrical Tape. 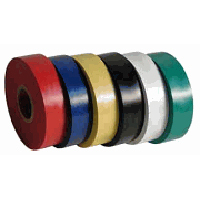 PVC Electrical Tape used for insulating wire splices. Handy for colour coding cables. We Stock: Black, Brown, Blue, Green, Grey, Orange, Red, White & Yellow 3/4" x 60 Feet.